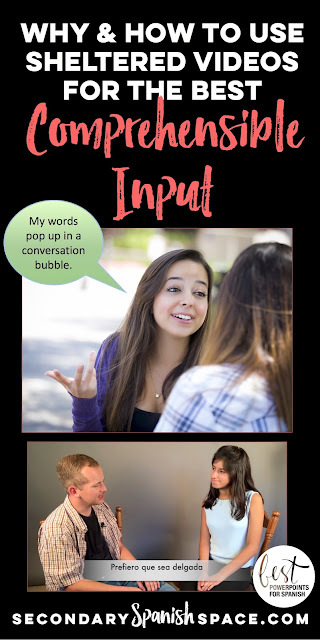 Do you ever wish people had conversation bubbles next to their heads while speaking? Especially those who have accents you are not accustomed to? Do you ever miss an entire crucial conversation of a movie because you have no idea what the actors are saying, a problem that would easily be remedied by subtitles? Or am I the only one in need of hearing aids? In our zeal to provide authentic listening resources to our students we may make the mistake of using input that is incomprehensible. The best comprehensible input has several components. 1. It is comprehensible and spoken slowly enough to be understood. 2. It captivates the interest. 3. It focuses on the message, not the form, on communication, not grammar. Research also proves that interaction helps students acquire the language. Therefore, it would appear that the best way for a student to become proficient would be to engage in a conversation with a captivating, slow-speaking native speaker who uses language the student can mostly understand, repeats often, does whatever is necessary to make his/her message understandable, and who has a conversation bubble next to his/her head to aid in comprehension. Ha ha ha ha! Actually, a model of this comprehensible input is available, and it is even more effective than the scenario I just described: videos in the target language with target-language subtitles (in place of the bubbles) and visuals to aid in the comprehension of unknown words, i.e. sheltered videos. Where do you find such a resource? I have found many such clips about daily routines but videos about other topics were practically nonexistent on this planet. After exhaustive research I was able to find a few gems although without subtitles. You can check them out in my post, Videos for Comprehensible Input. For most of my needs, however, I came to the unhappy conclusion, as is most often the case, that if I wanted the video resource I imagined, I would have to create it myself. So, of course, I did and delighted in watching my students absorb the language naturally as they sat, mesmerized, by a compelling story they actually understood. After the video, more repetition in context flooded their young brains in the form of related questions and activities. How do you use these videos in the classroom? 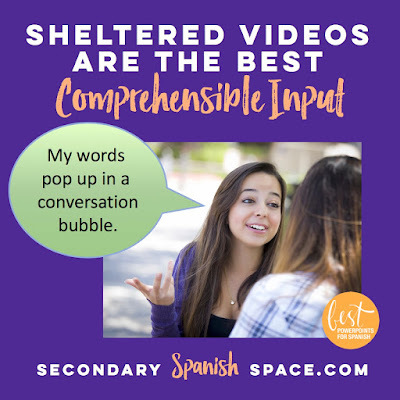 These types of videos are also excellent for targeted comprehensible input, essential for the proficiency of students who do not begin second-language learning in elementary or who are on a block schedule with an insufficient amount of instructional time. Targeted comprehensible input is the presentation and recycling of selected vocabulary or grammar with the purpose of providing an abundance of repetition in context. Non-targeted input does not focus on any particular vocabulary or structures but rather uses any language necessary to convey the message. Both targeted and non-targeted have the goal of FOCUSING OF A MESSAGE AND COMMUNICATION, rather than grammar. So, if I want to teach a unit on clothing but I can’t give my students the experience of shopping and talking with a sales-person in Spain, I show them a video, with subtitles and overlaid visuals about two girls shopping and describing their own and others’ clothing. Then, I follow up with questions about the movie, students’ clothing and shopping habits as well as multiple other activities related to the topic. After exposure to the sheltered language I have provided, students are ready to hop a plane and communicate with a real person in a real store because now the authentic language they will hear will be about L+1. Sheltered videos are the best comprehensible input for so many reasons: Students are 100% engaged because the resource is visual and the story or topic hooks their interest. The teacher can monitor the students as they learn instead of doing a song-and-dance. Students absorb the language almost automatically in a simulated authentic experience. They provide tons of repetition in context with slow-speaking native speakers. Students learn surrounding language, connecting words, and syntax not formally taught as they focus on the message, not grammar. They have become my favorite resource in the world language classroom.